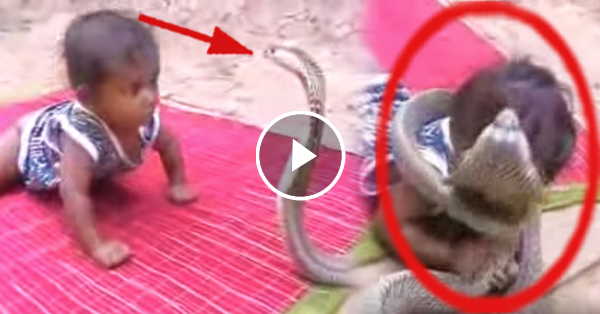 One-year-old baby gets bitten repeatedly by a king cobra! SHOCKING! Home / Life / One-year-old baby gets bitten repeatedly by a king cobra! SHOCKING! We all know for a fact that King cobra is one of the most feared specie of snake. In fact, a lot of people claim that a single bite from this king cobra can easily take away a person's life. Now, a video of a king cobra that plays with a one-year-old baby is now circulating online and has been shocking the netizens! In the said video, the 1-year-old baby was seen crawling near the king cobra and without hesitations, the king cobra bits the baby. A lot of people quickly reacted by saying that they shouldn't have filmed this and protected the baby instead. It turns out that the mouth of this king cobra was stitched up and that its fangs were removed that's why they allowed the baby to come near the snake. However, a lot of people quickly reacted by saying that the fangs of cobras quickly grow back that's why this practice should be stopped right now.